The perimeters of our cultural and societal landscapes are breached in Victoria Lucas’ solo exhibition. 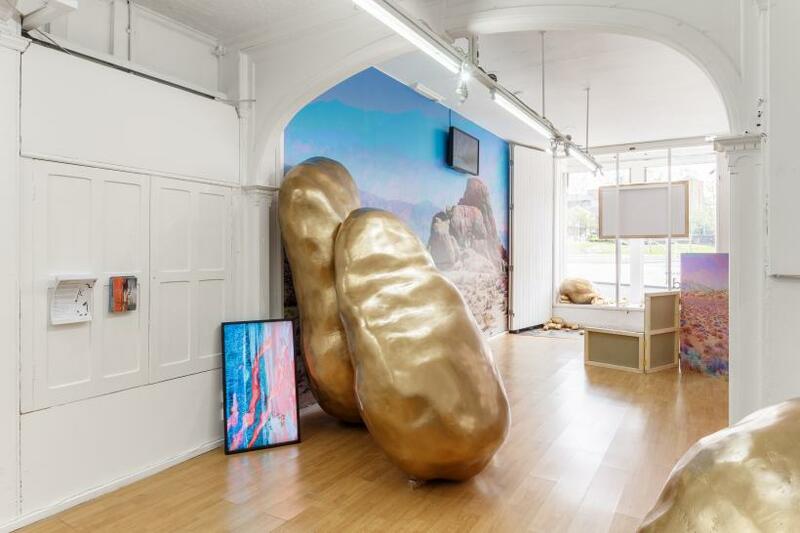 Continuing its multi-faceted journey – previously touring to HOME in Manchester and the London Art Fair – ‘Lay of the Land (and other such myths)’ evolves into its latest incarnation within the confines of AirSpace Gallery. 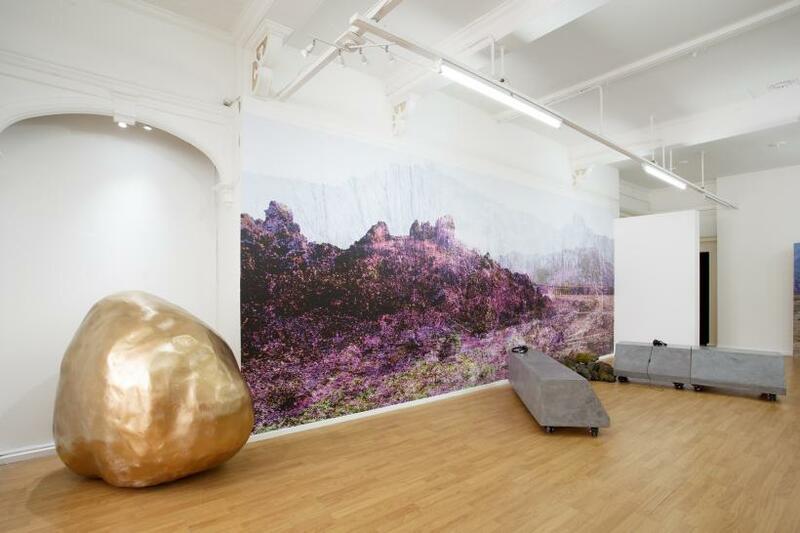 Working with Mark Devereux Projects to curate an immersive installation, the Sheffield-based artist has created a glamorous and cinematic dystopian terrain with a city-specific soundscape that examines both female representation and the urban wastelands that lay within our blind spots. Adopting the notion of life beyond conformity from JG Ballard’s 1974 novel, ‘Concrete Island’, Lucas’ project is littered with Westernised histories and remnants of the female form. 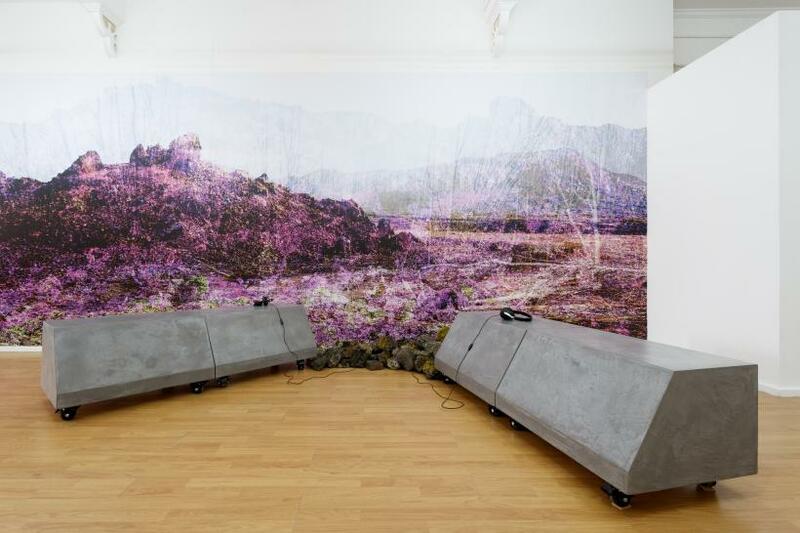 Comprised of photographic prints, video compositions, gleaming boulders and sound works – all of which appear sublimely psychedelic, bar a pile of plundered brownfield rubble – ‘Lay of the Land’ reframes visual and textual signifiers into an engaging, critical discourse. From the moment you pass the gallery’s window, you recognise that another world, or way of living, awaits. 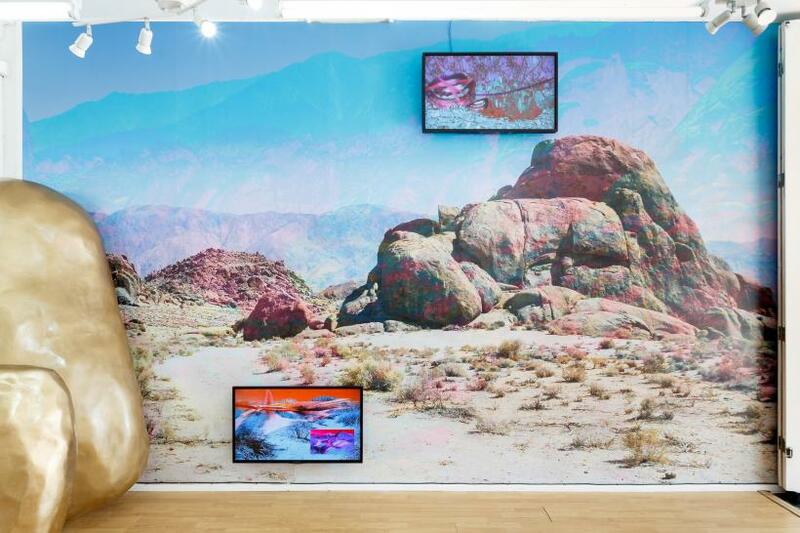 The spectral colours of ‘Psychedelic Western #3’ (2015) provide a rich exhibition excerpt – its vibrant and effervescent depictions of the Alabama hills are repeated in the show’s wall-sized prints and theatrical screens. 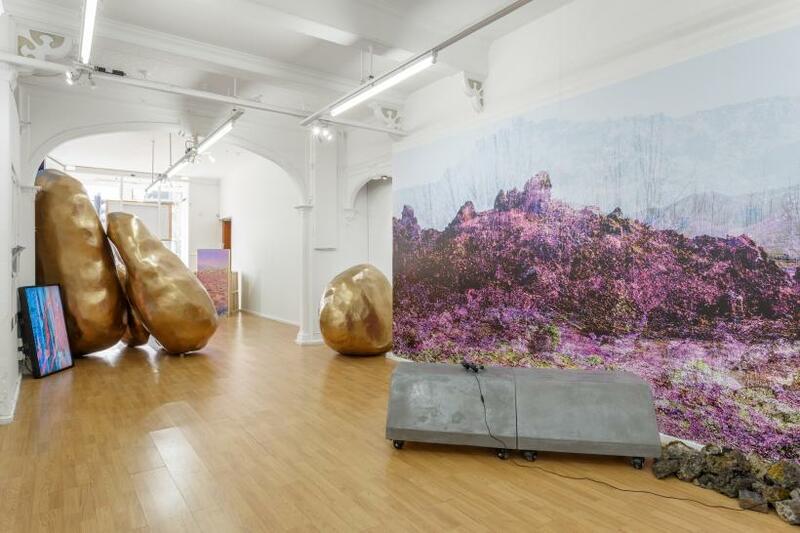 A feminine sigh welcomes you into the space, while deceptively light boulders – made from layers of polystyrene, fibreglass and jesmonite – catch your eye as they glisten under the gallery’s spotlights. 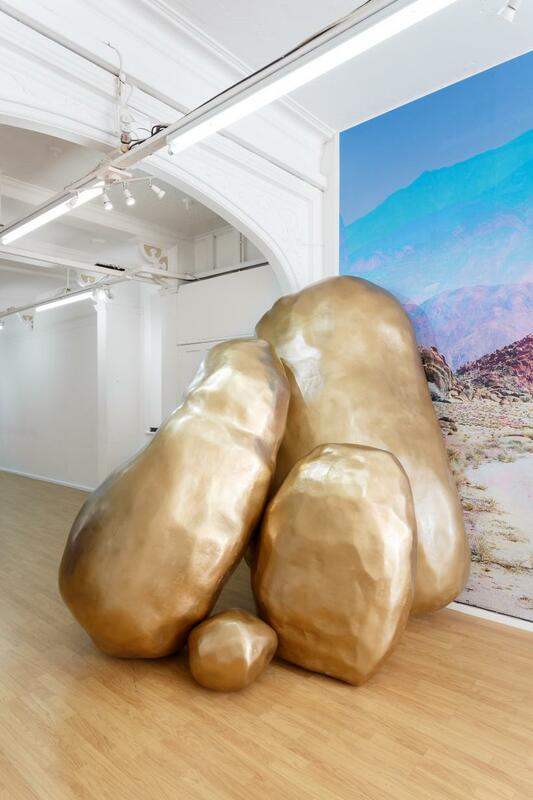 Drawn to their weighty surface and scale, the viewer is encouraged to delve between the crevices of this ‘fool’s gold’ that lay propped in a state of poised instability. Calling to mind the work of Pipilotti Rist are videos on flat-screen monitors presenting disembodied mouths floating across near-iridescent martian landscapes. 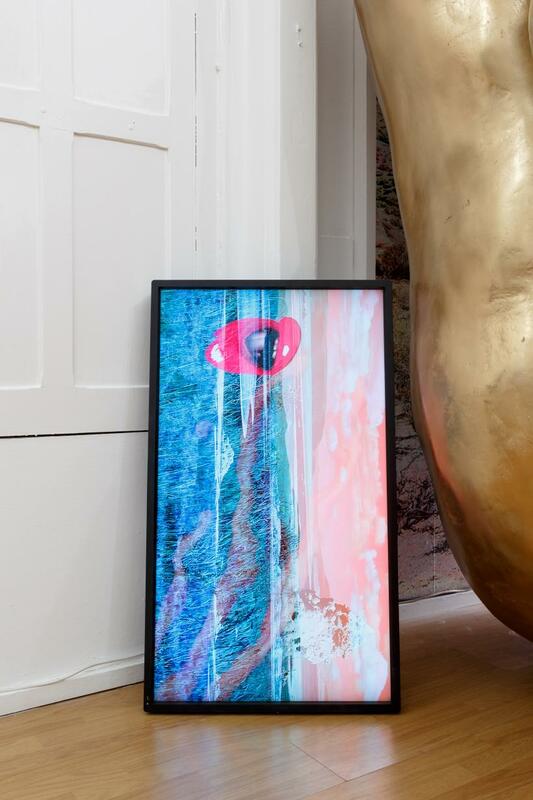 ‘Imaginary Voice #1’ and ‘#2’ (2016) exude sensually-charged colours amongst digitally engineered anamorphic forms. 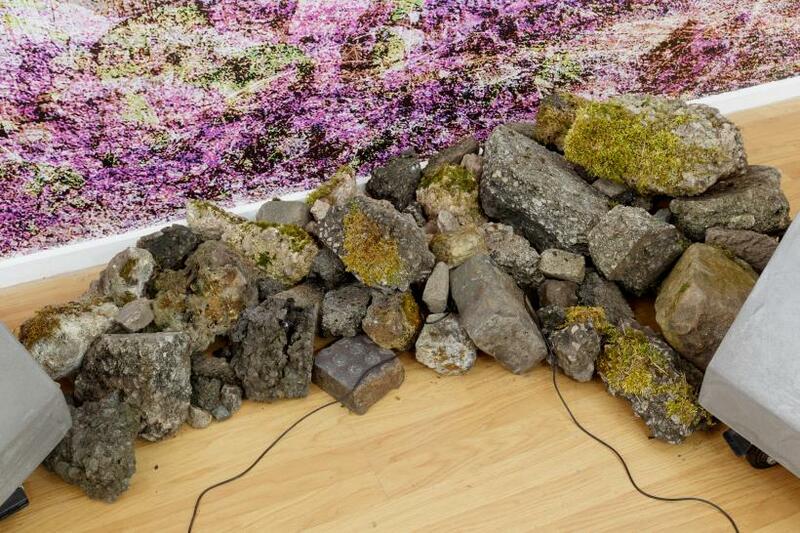 Likewise, ‘Body / Image #1’ (2016) overlays feminine remnants over a grassy scene punctuated by a rock-face that resembles an atomic mushroom cloud. An apocalyptic break-down of digital matter makes way for a disseminated aesthetic that questions the infiltration of the virtual into our everyday realities. The digital-self abuses our perceptions and blends femininity’s realities with falsities. Providing a ‘way-in’ to an alternative reality is ‘Concrete Island’ (2017). 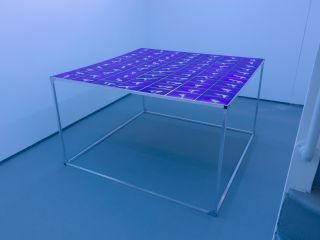 Comprised of an ultra-violet backdrop – part Stoke brownfield, part Lanzarote – it invites viewers to lay on one of two concrete benches; each measuring the average height of a woman in the UK. Laying across these cold, minimalist slabs, the audience is enlivened by a pre-recorded soundscape by vocalists through a set of headphones. 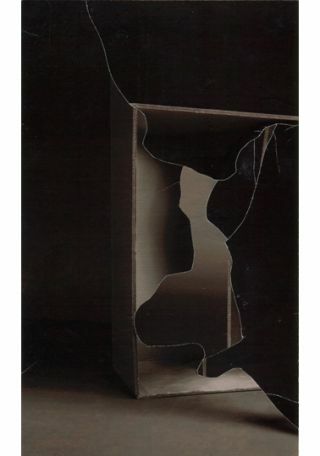 The notion of the female fighting against ‘dominant culture’ is evident in the pitching of an all-female harmony against dormant blocks that mimic the sculptures of Donald Judd or Carl Andre. The females challenge their entombed form in a penetrative soundtrack that disassociates their voices from the traditional notion of ‘singing’. They pierce through the facade of external expectation and with it, our rigid view that women, and the abandoned wasteland, exist inaudibly on the outer-rim of our constructed society. As with ‘Concrete Island’, video piece ‘A Staging’ excels in showcasing the sheer, non-linguistic power of the choir’s vocal chords in an isolated terrain. Set within a brownfield, the five performers are free to control their own bodies and space, with Lucas providing only a minor reminder of ‘order’ through her orchestration. Beginning in a choir-esque semicircle, the group disperses as the sound builds and reaches a cultural ‘breaking point’. 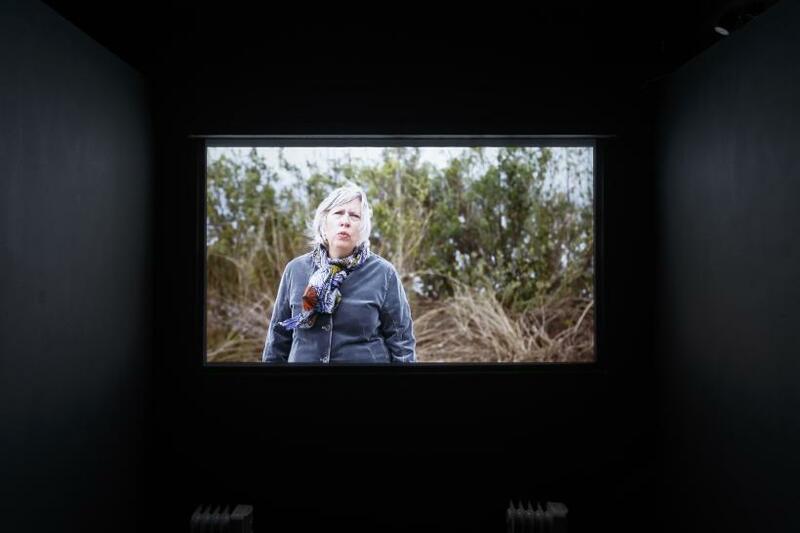 ‘Lay of the Land’ is a visual and acoustic portrayal of Lucas’ research into the ‘Feminist Framework’. 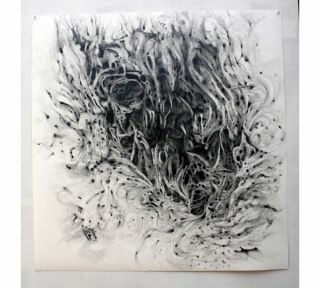 The artist’s digitalisation of feminine remnants correlates with Amelia Jones’ notion that the body “is understood as an image – but as an image understood itself, as embodied,” while Teresa de Lauretis’ theory that females remain “inaudible” is addressed through the audibility of women in a non-conventional way. Lucas challenges the inhibitions that society places upon gender through a dissection, and merging, of’ place. The artist moves freely from the glamorous Californian desert to the ‘damaged’ brownfield: a location where women can walk on unclaimed ground. In line with Rebecca Solnit’s idea that society is “walking on ground concerned with controlling women’s sexuality”, Lucas suggests that this ‘undesirable’ land is the closest thing to a verifiable, albeit abstracted, reality.